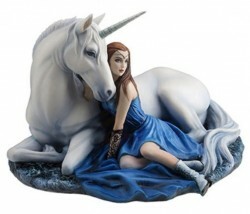 Beautiful finished heavyweight figurine from the Anne Stokes collection. A female mage with unicorn friend. Dimensions: H: 13cm L: 19cm D: 16cm.